Topics: Services, Repair, Electronic Board Repair, Maintenance, Customized And Personal Plans, and Installation. It has 2 DNS records, ns1.dotcomwp.com, and ns2.dotcomwp.com. It is hosted by Ihnetworks Llc California, using Apache web server. 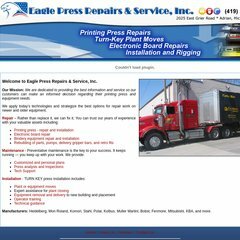 Eaglepressrepairs.com's server IP number is 72.34.41.182. PING (72.34.41.182) 56(84) bytes of data.